All plots are four feet wide, with large plots measuring 20 feet long and small plots 10 feet long. Included in the garden fee is all the water provided for the season. 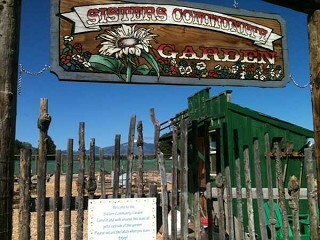 For those hoping to become a member of the garden this summer, signups are available in the green garden shed in the garden or for more information and an application form check the garden website at www.sisterscommunitygarden.org. This summer will be the fifth year at the garden's current location at the Sisters Eagle Airport, entrance off Barclay Drive. Prior to 2013, it was located on South Adams Street on a city lot belonging to Habitat for Humanity and leased for $1 per year. The garden represents much more than a collection of raised beds, wood chip paths, and a greenhouse. The original garden was begun as a project in response to a segment of the 2005 Sisters Country vision statement, creating a place to promote community connections. From its humble beginnings, the garden has become a horticultural showplace with 49 cedar raised beds, fully irrigated with spigots at each garden plot, and a substantial greenhouse engineered and built to withstand any type of Central Oregon weather. Grants from the Cultivating Local Food Program and the Sisters Garden Club helped with the purchase of materials for the perimeter fence, cedar two-by-10s for the raised beds, and an irrigation system. The garden serves as a learning environment for novice gardeners and seasoned veterans. The Sisters High School Life Skills class works in the garden spreading wood chips, pulling weeds, and planting and tending an elevated garden plot of their own. Last summer the garden donated about 450 pounds of produce worth around $300 to the Kiwanis Food Bank. One of the garden plots is dedicated to produce solely for the food bank and donations come from other gardeners' plots as well. Longtime gardener Donna Parker spearheads the donations to the food bank. The garden is also a lovely venue for a variety of social activities. Each Thursday of Quilt Show week, garden members provide a tasty lunch for over 150 visitors and locals participating in the annual Sisters Garden Club Garden Tour. Quilts hanging from the garden fence flutter in the summer breeze and table and chairs are scattered throughout the garden to provide spots for visitors to relax and enjoy their lunches. The funds raised by the lunch service help cover some of the annual expenses for the garden. This year's lunch will take place July 6. For the past two summers, the garden has hosted an appreciation dinner in the garden for donors who have provided monetary and in-kind materials for the garden. Live music was provided by The Anvil Blasters and people gathered for food, fun, and fellowship as they watched the sun set behind the Three Sisters. Bob Lawton, vice president of the garden board, indicated they plan to make the dinner an annual event due to its popularity. There are also plans for events such as Music in the Garden, cooking classes, and benefit fundraisers for local charities. Garden participants are encouraged to help tend the six communal flowerbeds, herb gardens, and fruit trees and berries, and to share in their bounty. Last year the first apple harvest consisted of one Honey Crisp apple. There are multiple blackberry, gooseberry, raspberry, and blueberry bushes throughout the garden. Besides tending their own garden plots, members are expected to participate in two garden-wide workdays held at the beginning, middle, and end of the gardening season. The greenhouse now has heat-activated roof vents that will automatically open when the temperature reaches a certain degree inside the greenhouse. A community grant from the City of Sisters helped fund the installation of the vents. Since there is no heat, the greenhouse gets too cold to be used in the winter. It is utilized by garden members to start plants early in the season, to be planted out in their raised beds as nighttime temperatures rise above freezing. There are shelves and counters to hold starter flats. There are also 20 three-by-three-foot raised beds for planting more tender, cold-sensitive plants. The east side of the greenhouse is open space where vegetables and flowers in pots may be placed. The greenhouse is particularly helpful for gardeners wanting to grow tomatoes. Pepper plants are no longer allowed in the greenhouse because of their tendency to attract aphids. Anticipated improvements in the greenhouse this summer will be gravel to cover the dirt floor and an automatic irrigation system for the raised beds. Marvin Benson and his wife Trine live just north of the garden on the grounds of the airport. Marvin serves as the garden manager and Trine is the membership chairperson. "The garden wouldn't be anything like it is without Marvin," said Lawton. Marvin and volunteers built the fence, which surrounds the garden, to protect it from the local deer. Airport owner Benny Benson did the engineering on the greenhouse and his employees constructed it. A board of directors elected by the garden membership oversees the operation and maintenance of the garden. Penny Elson is the current president.